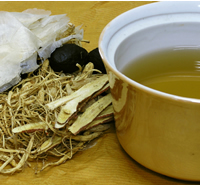 In traditional Chinese medicine, astragalus is often blended with other immune system enhancing herbs. In combination with codonopsis (Codonopsis pilosula), astragalus is used to strengthen the heart. Astragalus acts as an antiviral in early treatment of colds, and respiratory infections, including kennel cough. Recipe Instructions: Decoction : Astragalus may be taken as a strong decoction using 3 to 5 tablespoons of the dried root per day throughout the cold and flu season.